President Trump's long-running vendetta against Jeff Bezos, The Washington Post and Amazon got an unexpected supporter over the weekend, when Saudis, furious at The Washington Post’s coverage of the kingdom in the aftermath of Jamal Khashoggi’s murder, have called for a boycott of Amazon.com because of its shared ownership by U.S. billionaire Jeff Bezos. As Bloomberg reports, "Boycott Amazon" was the top trending hashtag on Twitter in Saudi Arabia for several hours on Sunday, as users circulated images showing the deletion of the Amazon smartphone app. When you insult the Saudi Crown Prince, you insult the Saudi people. All the Saudi people are King Salman and we are all Crown Prince Muhammad. "I was so excited for Black Friday! But unfortunately since #Washingtonpost is double standards against my country #saudiArabia and support propaganda of Erdogan I decide to stop any plans to buy anything in @amazon," one tweet read. It was repeated eight times on different accounts with the same spelling errors, suggesting at least some of the anti-Amazon resistance was being led by bots. Bloomberg's efforts to contact users behind those accounts weren’t successful. Saudi citizens - feeling that their country is under attack since Saudi agents killed Khashoggi, a WaPo columnist and dissident, at the kingdom’s consulate in Istanbul - also called for a boycott of regional subsidiary Souq.com, acquired by Amazon last year. Saudi anger boiled over after the WaPo published a scathing op-ed article by Turkish President Recep Tayyip Erdogan on Friday in which Erdogan claimed that "we know that the order to kill Khashoggi came from the highest levels of the Saudi government", as well as by the newspaper’s ongoing coverage of gruesome information about the murder obtained from anonymous Turkish officials. "It became clear before our eyes that this is an organized media war," said Bandar Otyf, a Saudi journalist with more than 100,000 Twitter followers who was among those calling for the boycott. "As Twitter users and activists and citizens, we don’t have power abroad, but we have simple things like boycotting", Otyf said. In what will come as music to Trump's ears, Otyf said that many Saudis are learning for the first time that Bezos, the founder and chairman of Amazon, separately owns the Washington Post, adding that "if we affect even a portion of their business, we’re satisfied." I just found out that the majority owner and CEO of Amazon @JeffBezos is the owner of @washingtonpost. I have been a very active customer of Amazon since 2006. From this moment, I will boycott Amazon in protest of the unjustified attacks on Saudi Arabia. While Amazon is little used in Saudi Arabia, the Amazon-owned Souq.com is popular: last year, Saudi Arabia’s sovereign wealth fund invested in a competing e-commerce firm called Noon, which was founded by the chairman of Emaar Properties. This is not the first time Saudis have called for a boycott related to the Khashoggi murder: three weeks ago, Uber faced similar calls for a boycott of its app in the Persian Gulf in response to the reaction of CEO Dara Khosrowshahi, who was among several business leaders to announce they were pulling out of an investment conference due to take place in the Saudi capital later this month. In light of Bloomberg's extensive report on "The Inside Story of How Uber Got Into Business With the Saudi Arabian Government", Saudi threats against Uber appear especially hollow. 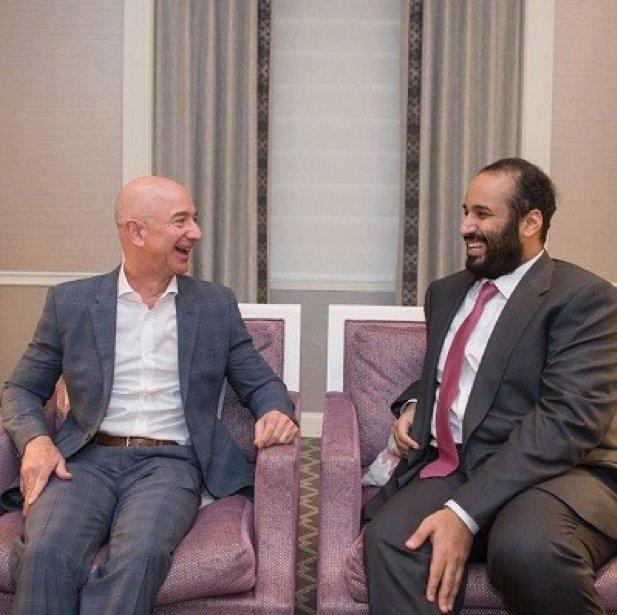 ... showing Bezos sharing a moment of levity with MbS back in March and suggesting that for all the angry echo-chamber rhetoric, it is anything but business as usual.